In the blue corner is the former England coach re-making himself in Leinster colours, in the black is the former Ireland centre enjoying unprecedented success with Saracens. When Joe Schmidt decides to part company with Ireland, Stuart Lancaster and Mark McCall will both be in the frame to replace him and both have plenty to play for when their sides go head to head at the Aviva Stadium on Sunday. Both men have been up before the media this week and neither would be of a mind to blow his own trumpet, but they are getting plenty of credit from the players they have worked with. Lancaster's redemption story is being seized on in the English media, with Jamie Heaslip's comments that he rates the former international coach along side Joe Schmidt in his estimation getting plenty of traction. Former Ulster coach McCall has always maintained a low profile, allowing his Saracens team's exploits to do the talking for him: he has guided the English club to back-to-back Premiership titles and then and successive European Champions Cup titles during a dominant three-year period. Were Ireland to come calling in 2019, when Schmidt is expected to head back to New Zealand, Saracens scrum-half Richard Wigglesworth believes McCall would be a natural fit. "Absolutely, any coach who has had sustained success has obviously got a lot more right than wrong," he said. "With that comes a lot of experience; he's been through everything now, he's been through putting a team together, he's been through building it all from the beginning. He's been through losing finals, winning, all of the challenges that come with it. "I'm sure when you've been through all of that sort of stuff, if a top job comes up then I'd imagine he'll be near the top of the list." A determined centre who punched above his weight, McCall won 13 caps for Ireland between 1992 and 1998 and captained Ulster in the famous 1999 season, missing their European run due to injury. 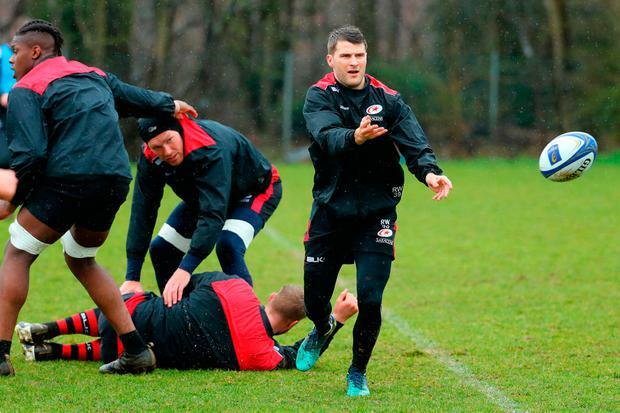 He began his coaching career with his home province, but resigned in 2007 and set about building his career abroad with Castres, where he worked under his former team-mate Jeremy Davidson before joining Sarries as first team coach in 2009. After two years working beneath Brendan Venter at the London club, he became director of rugby in 2011, and with substantial backing behind him he built the club into a European force. "He believes in what we do and when you have got someone who doesn't waver from that belief, you never you never get a sense of him that he is thinking of about changing and doing things differently," England international Wigglesworth said. "There are always little tweaks in there but generally he has belief in the organisation that he is running, trusts his coaches and his players to get on with it. "There is a real level of detail and application to what we do, and to keep us on the track we have been on." The 34-year-old was in diplomatic form during his 20-minute briefing with members of the Irish media ahead of Sunday's game, heaping praise on Leinster and their Irish contingent. And he said he was delighted to see Lancaster thriving since his move across the Irish Sea to work alongside Leo Cullen as Leinster's senior coach. "Definitely. Anyone who worked under him with England is pleased that he's been given an opportunity to show what can do," he said. "All the noises coming out of Leinster are that he's doing a fantastic job. "Hopefully, it doesn't go too well for him on Sunday, but it is pleasing for anyone who has worked with him to see him back in the top level." McCall is also delighted to see Lancaster thriving. "He has done an unbelievably good job," he said. "We're thrilled for him because of what happened to him in 2015 - it is hard for any coach to come back from. He was very wise to take his time, chose the correct job to go to and has clearly made a huge difference there. "He is a really good bloke and obviously a good coach. It seems like an organisation transformed since he has been there." Although they have largely been on the upward curve, Saracens suffered a significant wobble in the pool stages - losing heavily to Clermont at home and squeezing into the last eight as the bottom seed. Their recent success has filled them with belief, but Wigglesworth conceded that even they wavered during that troubled time before Christmas. "I'd love to tell you that our belief never wavered for one second but when you play like you did at home against Clermont, you do ask questions of yourselves," he said. "I think the management can take great credit for believing in what they believed what was right and backing our reaction over a period of time. "We snuck in by sticking to what we did and we were more than happy to get through without playing our best rugby - it is now knockout rugby with everything to play for. "We have been there before but we know we have a massive, massive battle - Leinster are top seeds for a reason, they are playing brilliant rugby." Subscribe to The Left Wing, Independent.ie's Rugby podcast in association with Laya Healthcare, with Luke Fitzgerald and Will Slattery for the best discussion and analysis each week. From in depth interviews with some of Irish rugby's biggest stars to unmatched insights into the provinces and the national team, The Left Wing has all your rugby needs covered. Daragh Small Irish lock Quinn Roux has emerged as a doubt for Connacht's PRO14 quarter-final showdown with Ulster on Saturday week. Declan Rooney Experienced Munster flanker Chris Cloete admits it won't be easy to get over their Heineken Champions Cup loss to Saracens and turn their attentions to hosting Connacht this weekend.